Usual Disclaimer: Everything I am about to say may or may not be true, I don’t know these people and I have no way of knowing what “really” happened. But this is the commonly accepted version of the story told in the press and among the public. If you are new to the films, or somehow have missed this part of the story, it may fill in some gaps. Back in my first section, I talked about how a lot of this is from Rosie Thomas’ article on Nargis. She uses Nargis as a case study for how the onscreen persona of stars in India can affect their offscreen lives. So far, Nargis has been a good example of that, her free modern onscreen image interacting with her life as a single career woman with a married boyfriend. But it’s in this section that she starts to go from just a “good example” of this, to something really special. Her onscreen image and its interactions with her offscreen image, having an effect far beyond the film industry and popular culture. At the end of the last section I had gotten her to Mother India and then marriage. 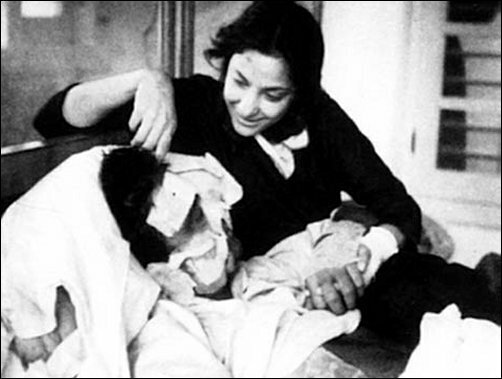 I mentioned how Mother India wasn’t just “the movie where she met Sunil Dutt”, it was the greatest performance of her career in the greatest female role ever in Hindi film. And I also argued that she didn’t leave Raj Kapoor for Sunil Dutt, she left him for Mother India. She was tired of being his modern carefree woman, and his untouchable ideal in a white sari, she wanted something more. And she got it! Not just from Sunil Dutt, but from Mother India. And not just from Mother India but from Sunil Dutt. The two things coming together are what made the change in her “real” life and in her image. She married Sunil 5 months after Mother India came out, and their first child Sanjay was born a little over a year later. Mother India forever changed her onscreen image. She went from being the modern educated urban woman, to the spirit of the peasants and the farmers of India. A mother above all, just like the title said. If she’d kept acting, maybe that image wouldn’t have lasted. Even if she’d only taken peasant mother roles from then on, there would still have been the dissonance of her playing a humble peasant mother onscreen and being a dashing single career woman offscreen. And what if she’d been offered another dashing modern role? Would she have turned it down just to protect her Mother India image? Or heck, what if she’d married someone else? Someone who forced her to keep working, or to leave India, or any of that? But instead we had the perfect coming together of onscreen and offscreen image. She played the pure devoted soul of India onscreen. And she married Sunil Dutt and became the pure devoted soul of India who inspired him offscreen as well. Sunil wasn’t like other actors. He wasn’t that much unlike them, the 1950s was a time of a lot of social consciousness and responsibility, a lot of the film people were concerned about contributing and doing their part for society. But Sunil went a little farther than the rest and officially joined up with the Congress party, bringing his wife along with him. 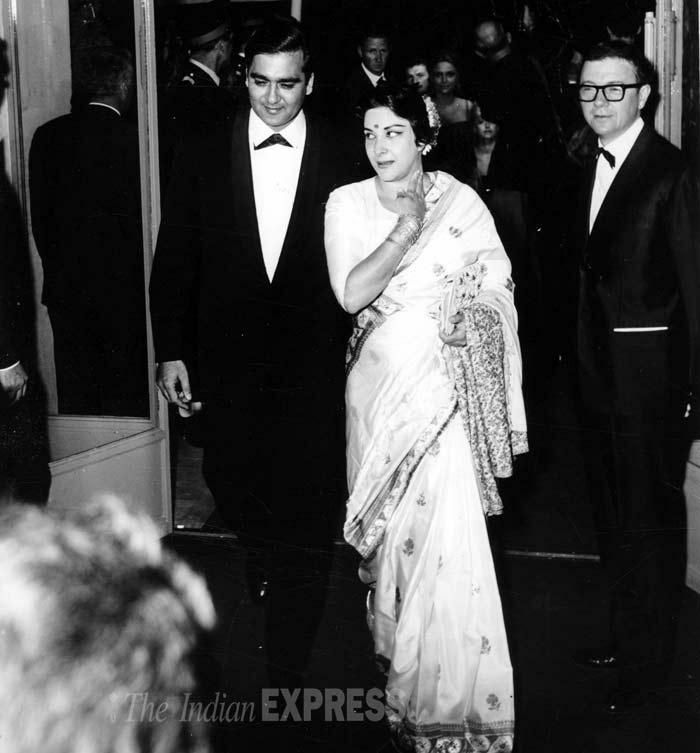 Nargis’ friendship with Indira Gandhi was well-known by the public. 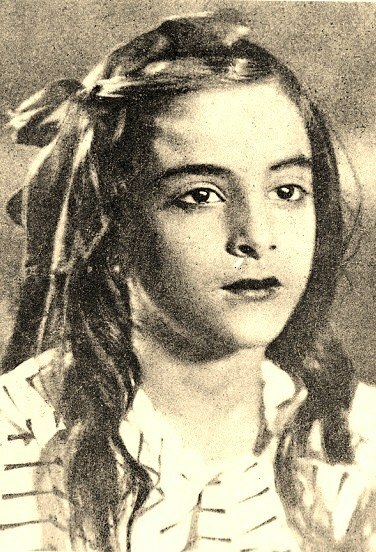 Throughout her time as Prime Minister, it became accepted to see the two of them attend events together, and the press and public naturally started to conflate the two, Nargis becoming what Thomas calls “Indira’s more glamorous twin.” Both women were seen as modern, powerful, but ultimately “mothers” above all. They were conflated so much, that a recent biography of Indira was titled “Mother India”. While Nargis was nominated for the Rajya Sabha, and her husband and daughter both elected to the Lok Sabha. Somehow the image of the sacrificing Indian woman of Mother India became applied to both of them. And that image was part of the wave that Indira rode in election after election. I don’t want to say that Nargis was all image and political connections. After Mother India and marriage she stopped acting, but she didn’t stop using her public image. She lent her name and time to The Spastics Society of India (“spastics” being old-timey talk for children with cerebral palsy). She and Sunil also founded an acting troupe that traveled to entertain army troops stationed on the frontiers and borders. But everything she did was always framed as part of her duties as a wife and mother. She founded the acting troupe in partnership with her husband, she worked with a charity for children. And most of the stories about this time focused on her happiness as a wife and mother serving a noble man. Sunil really was a great guy. He turned producer soon after marriage, and cranked out film after film, all artistically experimental and socially conscious. He became an acting star as well, working with all the top producers and directors. And he was generally liked, and respected, in the industry. And he made sure to “spend” that popularity and respect in making sure his wife was respected as well. Nargis went from being Raj Kapoor’s sidepiece, the casual independent actress you could joke with on sets and drink with at night, to being “Nargisji”. I read an interview with a young actor who was starting out in the 70s (can’t remember who) and he talked about being cast for a Sunil Dutt movie. Sunil invited him over to his house to talk about it along with some other young artists, writers and composers and so on. And after they arrived, “Nargisji” came out to offer them food and drink herself. They all leaped to their feet, of course, and were honored by her graciousness. She brought out food and talked with them for a while, and then went back into the house and they moved on to their real business. So different from her earlier life! Men calling her “ji”, standing when she entered a room, keeping the conversation light and waiting for business until she left. And young men being honored just at the idea of her offering them food from her own hands. Not because they see her as a desirable woman, but as an almost holy figure. For another woman if might be kind of sad that she wasn’t allowed her casual friendships and intoxicating career and all of that. But this is what Nargis chose. She could have kept working as long as she wanted to, no need to get married, she quit at the peak of her popularity. But once she did get married and retired, isn’t it nice that she got to go all the way? Thanks to her husband leading the way, she went from being everyone’s friend to being everyone’s sister-in-law, not just as respected as any other married woman in Indian society, but more respected!!! Oh, and remember it wasn’t just the Raj Kapoor and years as a single woman in a man’s world that she had to overcome, it was also her identity as a Muslim woman married to a Hindu man, and the daughter of a Tawaif-like household. And Sunil got her past all of that. And, by the way, never asked her to convert to Hinduism and encouraged his children to respect both sides of their religious heritage. And this is where that strange “art creating life” effect starts to happen. In Mother India, Nargis goes from a young and in love woman (her life with Raj), to a strong woman who identifies more as a mother than a wife (what she became after marriage when the kids were little), to a woman who carries all of her community on her back (her identity as she began to do more social service and get more involved with Indira in the 70s). And finally, as the woman who must carry the suffering and sins of her flawed son on her own shoulders! 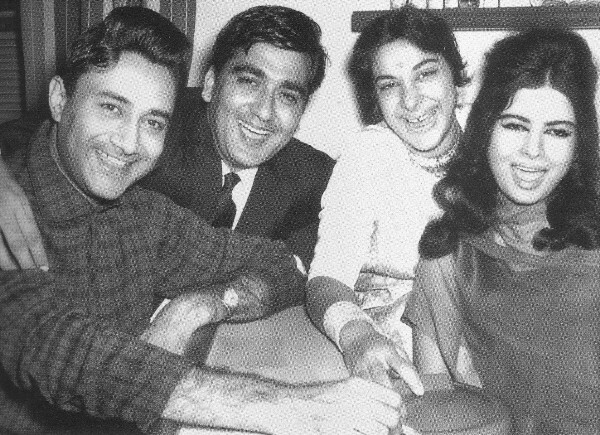 Through out the 60s, the Dutt household was pretty perfect. Sunil was successful both commercially and critically. Nargis had 3 children, a son followed by two daughters, and devoted herself to caring for them, only seen for the occasional family interview. Oh, and she also stayed in touch with her own friends from before marriage. Not Raj, but her girlfriends were still around and close to her. Remember, she was the one to offer to solve Meena Kumari’s tax problems! In the 70s, the kids and Sunil were both older and things got a little tougher. Sunil ran into some career issues, since he couldn’t exactly pull of the young dashing lead any more, and his last few films as a producer had failed as well. More troubling, rumors were starting to fly that this midlife crisis was leading him to cheat on Nargis. These rumors fall in the category of “could or could not be true, and could or could not have been a problem for Nargis if they were.” It’s not like with the Kapoor’s, where people have gone on record as to the affairs actually happening, and the damage they did to the marriages. So I’m not going to say the marriage was in trouble. But just the fact of the rumors alone can’t have been comfortable for Nargis to live through. And Sanjay was a teenager now, and he was a troubled teenager. I’ve never heard any real reason for it, he had a happy childhood in a loving home, nothing was really “wrong”. But then he got to be a teen and he had a harder and harder time relating to his father, and clung more to his mother as a result. He also started using drugs around this time. And not in a kind of “rich kid partying” way, but as a serious drug user. And, also slightly more than a “rich kid partying” kind of way, he started going around with older starlets. And then you run into the same problem parents always have with kids like this. One of them wants to bring the hammer down and force him to be better. The other wants to be more indulgent. The parents fight, the kid gets confused, nothing gets better. What makes it even odder is that Nargis is still living Mother India, now in the second generation! 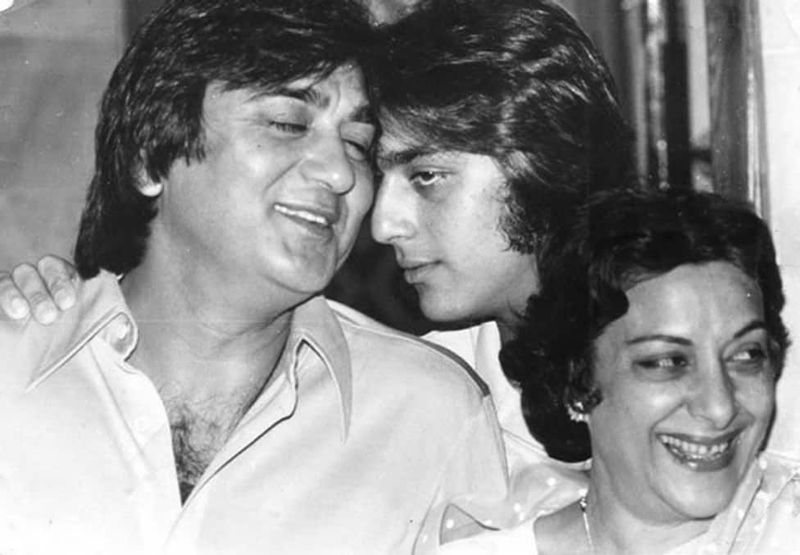 In the film, after Nargis has lost her husband and brought her two sons up with the sweat of her brow, her beloved younger son (played by Sunil Dutt) turns rebellious. He flirts with the money lenders daughter and skips school and generally starts going wrong. He loves his mother, but resents his older brother’s lectures. Finally he runs away from home. He joins up with a bandit crew and attacks his home village. To defend the community, after an epic chase scene (including that real life fire rescue), Nargis tracks him down. And shoots him in cold blood. Because she is not just his mother, she is the mother of all of India and must kill her son if he threatens her country. And the same thing happened to Sanju Baba! Well, sort of. He was heading in that direction, resenting his father and being spoiled by his mother. But they momentarily had him on a good track. He had always said he wanted to be a film star, so when he was 22, his Dad produced a movie for him. It went well, he was probably going to have the career and stardom he always wanted. And then Nargis was diagnosed with pancreatic cancer. Sunil flew her to New York for treatment and did not leave her side. Stories filtered back to India of how the American doctors were in awe of the devotion of this Indian couple. And Sunil’s prayers (and the prayers of all of India) seem to have worked, she was better and came back home. Only to be rushed to Breach Candy hospital in Bombay, and finally die. 3 days before the release of Sanjay’s first picture. Someday Sanjay will get his own Hindi Film 101 post, certainly sometime before the release of Hirani’s biopic on him. But for now I will just leave it that after his mother’s death, Sanju Baba went on to live out the course destined for him by Mother India. Well, and by his genetic tendency towards addiction. He was in and out of rehab through out the 80s, and on one of his rehab trips in America met and fell in love with a fellow addict Richa Sharma, a young actress with family in America. His father did not approve, possibly because addicts marrying addicts is not necessarily the best idea. Or maybe because he thought his son wasn’t mature enough for marriage. Anyway, the marriage didn’t last. They had a daughter, and 2 years after the marriage, Richa was diagnosed with a brain tumor. She moved back to her family in America, with their young daughter (Trishala) and Sanjay stayed in India. And continued his trips in and out of addiction. In the early 90s, Sanjay’s career was on a high. And so was his personal life. Despite the fact that his wife was dying off in America, he had started a hot affair with Madhuri Dixit. And then the Bombay bomb blasts case came up. And young police officer Rakesh Maria (the one whose father was ruined when Vinod Khanna ran off to America and swore vengeance on the film industry) traced a connection all the way to Sanjay. The Sunil story continues as well. The noble upright man who can’t understand or forgive the weakness of his son, and yet also can’t stop loving him. And the son who can’t manage to live up to his father’s expectations but still keeps trying. That’s what the first Munna Bhai film was giving the audience, a familiar story they had been watching between these two men offscreen for the past two decades put on screen. The nice thing is, if you look at Sanjay and the next generation as just continuing Nargis’ story which ended too soon, you get a nice happy ending to it all. One of Sanjay’s sisters entered politics like her father. 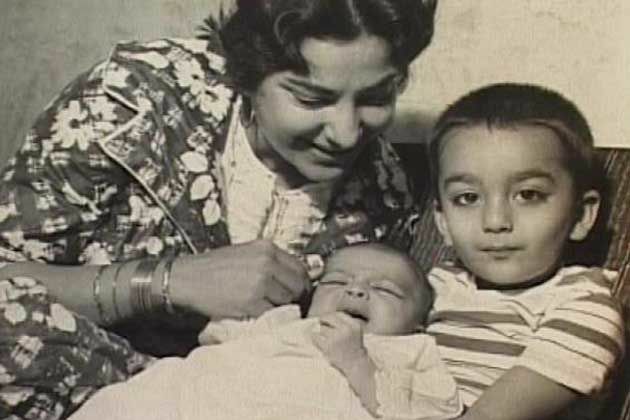 His other sister married Kumar Gaurav, son of the other star of Mother India, tying together the two families legally not just through a film classic. Sanjay’s first marriage ended badly, then his first jail term ended the relationship with Madhuri. His second marriage, to model Rhea Pillai who is still something of a presence in film circles, ended better and they are still on good terms today. And then his third marriage began very inauspiciously, with rumors that his new wife’s divorce from her last husband hadn’t been fully settled, and his family refusing to attend the wedding. Only it turned out the best of all! He and Maanyata have been married for 9 years now, they have two adorable children, she stood by him throughout the court cases and jail term, and she was there when he was released. To return home, greeted by all 3 of his children and both his sisters, but first stopping to visit his mother’s grave. This entry was posted in Hindi Film 101 and tagged Hindi Film 101, Indira Gandhi, Nargis Dutt, Sanjay Dutt by mredlich21. Bookmark the permalink. 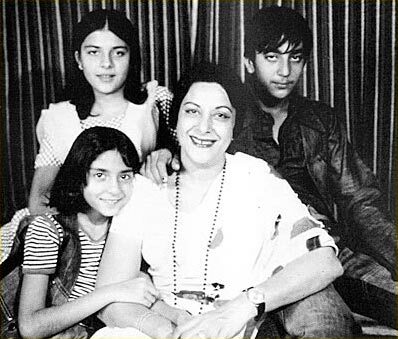 Amazing story of life imitating art.Sanjay Dutt picked up his drug habit at boarding school.And yes, Nargis spoiled him dreadfully.He was devastated by the death of his mother and depended on drugs to manage his grief.He reminisced years later that during his mother’s funeral he was taking drugs in the bathroom.Sanjay inherited his mother’s charm and everyone in the industry -including those who don’t kow his mother -has a good word for him.As per rumors, Sunil Dutt went to Bal Thackarey to plead for Sanjay’s release. 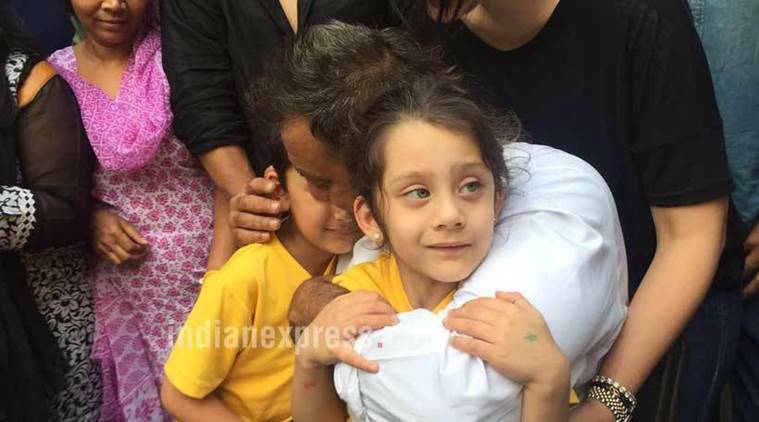 I’d heard the same thing about Sunil and Bal, and when I was trying to find images for this article I found one that I think is Sunil taking Sanjay to get Bal’s blessing the day he was released from jail. I find Sanjay charming and I haven’t even met him! Just on film, even when he is playing the villain, he is so easy to love somehow. Sanjay Dutt’s life seems really interesting now. I only knew about him being connected to some terrorist attacks before. Now I’m more intrigued by the Dutt biopic. This is just the loosest outline of it all, there is so much more to him! I am really curious about the biopic mostly because I want to see how they can condense the story down to one movie. It’s really more a trilogy kind of thing, or a miniseries. He is going to have to leave so much out! This was a very interesting story! I always wondered why Sanjay kind of gets a pass for all of the trouble that he’s been in. I read about him a few years ago before I got into the films (it must have been when he was originally convicted and sentenced in 2007). I remember being surprised by how many positive comments of support there were at the end of the article, for a man that was just convicted of terrorism! It’s quite remarkable. I will have to watch some of those movies he did with Madhuri (I had no idea they were together-he must have charm to land such a woman with a face like that). I’ve seen a few of the songs pop up on the retro hour on B4U Music and they’ve been great! Khalnayak and Saajan, I think, are his best Madhuri movies. And Munna Bhai MBBS is, I think, his best movie just as himself. Someday when I do my Sanjay 101 I will go into full detail about that terrorism conviction. But what you should know now is that it was technically under the “terrorism” category, but really it was just an illegal arms case. He had a bunch of guns hidden in his house that were given to him by a contact in the mob. Some people think the only reason he got such a heavy conviction and punishment was because he was a movie star, and his father had political enemies. The other thing to know is that he was initially convicted and then thrown into solitary confinement for months back in the 90s. He got out, and then over the next ten years he got his life together, had a career resurgence, got off drugs, got married, had kids, made peace with his family, basically turned into a completely different person. That’s why everyone was so upset in 2007, he had finally gotten his life together, and now he was being punished. That picture is not Richa and Trishala. 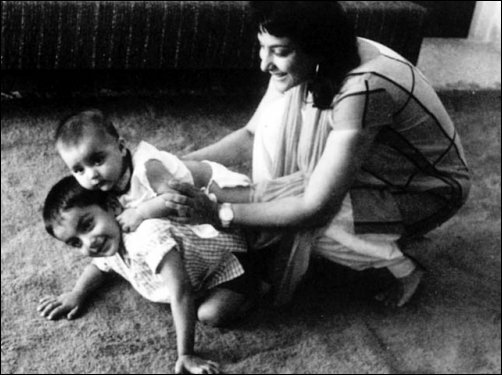 It’s Sunil, Sanjay, Priya Dutt, and Saachi Kumar, Namrata and Kumar Gaurav’s (not Gaurav Kumar) daughter. Thanks! It must have been mislabeled on the website where I got it. I’ll fix it!